Two years ago I created a few roosters. The first was for my friend Frances' birthday. 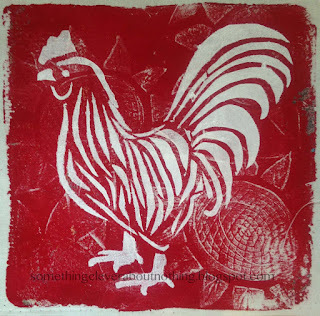 I mono-printed the images on to fabric for a birthday quilt she was creating for herself. 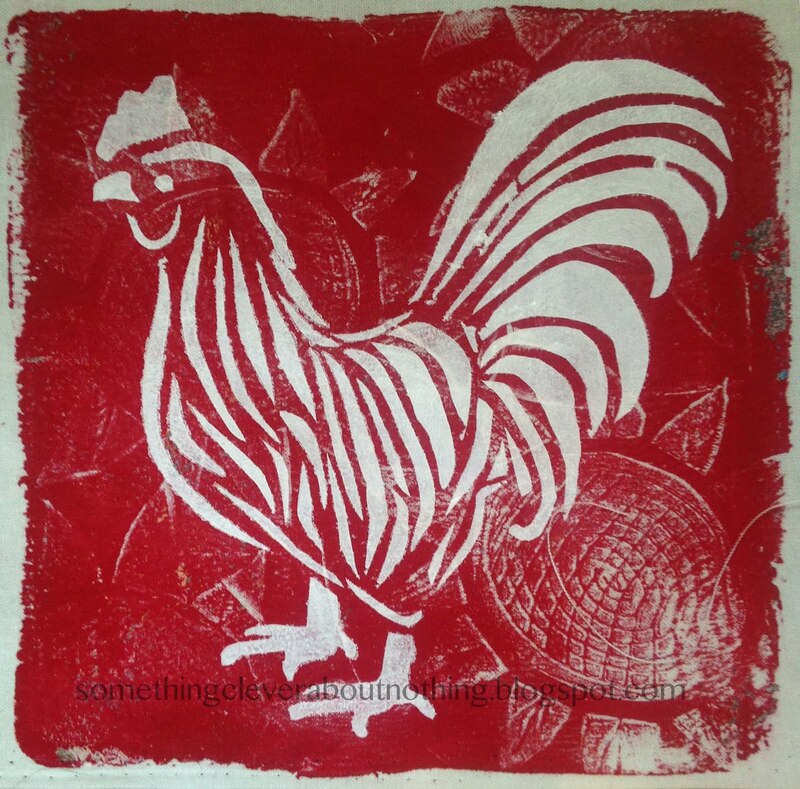 Another friend saw the rooster and asked for one to be printed on paper so she could hang it on her wall. 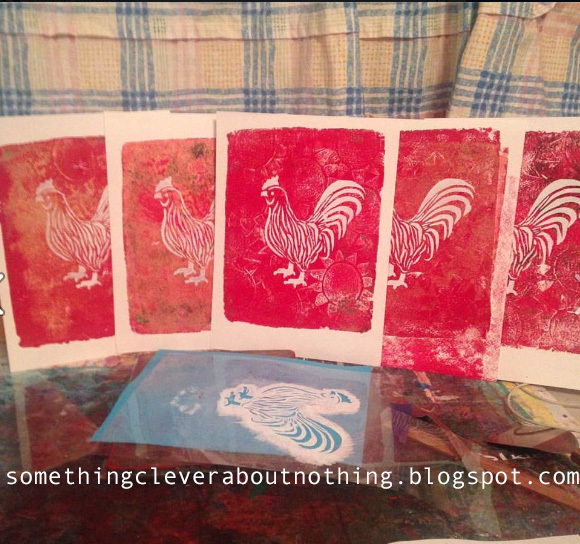 As with most printing I do on a gel plate, I couldn't create just one, so I made five. I sent her this photo and asked her to chose one. She chose all five. 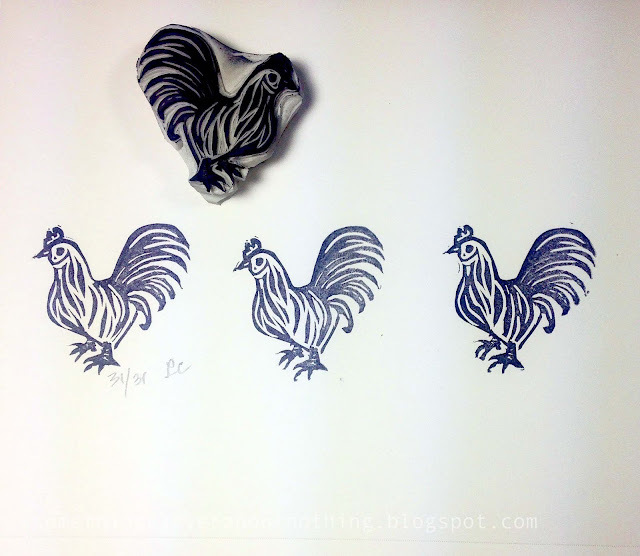 When I realized the Lunar new year at the end of January was going to be the rooster, I pulled out the old design and drew it small enough for a 2" square stamp. 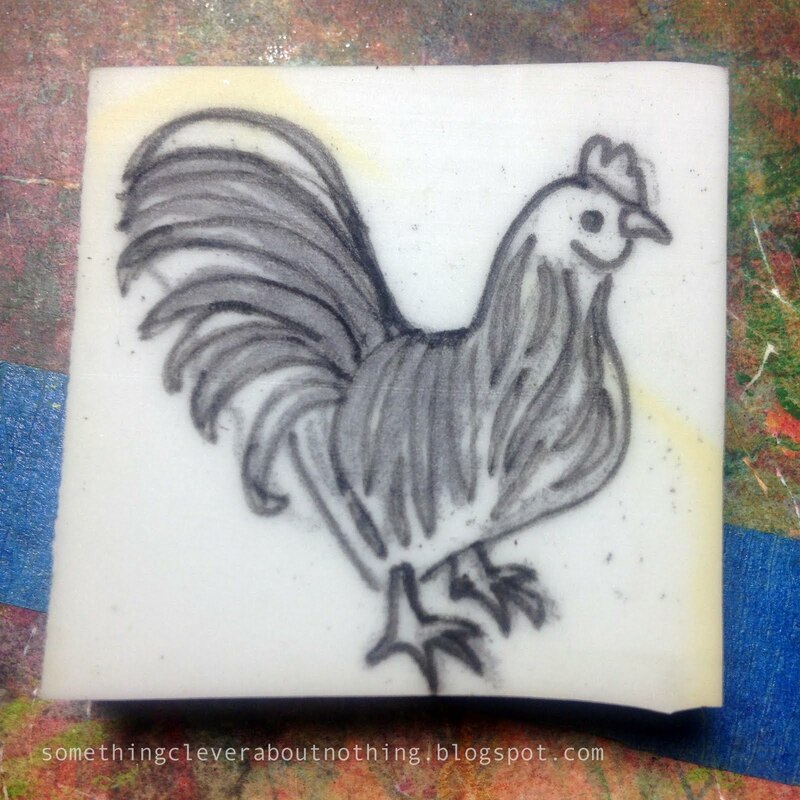 Once I carved the stamp I had to make minor corrections with the feathers and a pedicure. Look closely from right to left and you can see slight differences in his feet. The next day my daughter wanted to know what she could put on the front of a journal besides vinyl. "Paint." I said,"But I'm not sure how well the paint will go on your journal without experimenting. And I'm not sure how long it will stay on the cover." She is a very precise person. We talked about the possibilities of a design, and the colors she wanted. She had a gold design in mind. 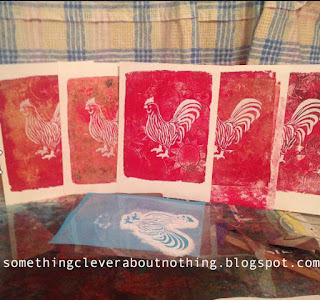 Suddenly I remembered my embossing pad and powders from my card and scrapbook making days (mental note: don't throw art stuff out). I pulled them out, along with a sketchbook, and we experimented using the rooster stamp. She didn't remember seeing embossing powder used and was very impressed as I heated the powder and it became a beautiful raised gold image. All the proper "ooos and ahhs" were said, making it a worth while experiment! 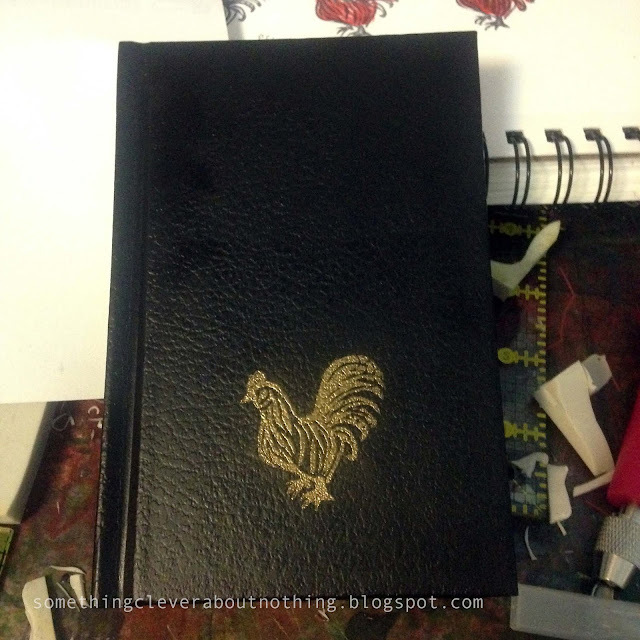 I really liked how Mr. Rooster came out on the journal and am thinking I need to use this mini-journal to sketch in everyday during the new year! Perhaps he will give me some new skills from daily practice. I just need to come up with a theme for the journey. In the meantime, my daughter is deciding what design I will be carving and embossing on her new journal. I will be sure to post photos of the project once it happens.